Cold weather and shorter days often mean spending more time indoors, choosing warmer clothing and, for those of us fortunate enough to travel year-round, migrating to warmer climes. The animals we watch face similar problems, and in some cases escape the cold in similar ways. Some migrate each year, while many grow a warmer coat. But some have another way to escape frigid temperatures and decreasing food supplies. They hibernate. Hummingbirds are one example of a short-term “hibernator.” Smaller creatures have a difficult time maintaining their body temperature, requiring that they spend most of the day consuming calories just to survive. This helicopter of the bird world may eat three times its own weight in nectar each day. Watch hummingbirds carefully, and you’ll find they spend three-quarters of their day perched on a branch. A small bird’s digestive system can’t process food as fast as it can eat, so the hummer conserves energy by waiting for its body to catch up. A hummer’s metabolism is one of the highest of all animals – about thirty times that of a human. During normal flight their wings beat over sixty times a second and their heart rate may climb to 1,200 beats per minute. If a hummer quit feeding it would soon starve. Although the hummingbird is a migratory species, frigid weather isn’t tied to a schedule. So how does this little critter make it though a cold night? Rather than just sleep, the hummingbird goes into a state of torpor; its body temperature dropping by as much as 50 degrees. The resting heart rate, normally around 500 beats per minute, may decrease by as much as 90 percent. Come morning the bird will vibrate its wings to produce body heat, bringing its temperature back above 100 degrees. Then it’s time to look for food and start the cycle all over again. Hummingbirds do move south as the seasons change, but its method of escaping the cold is shared by animals that don’t migrate. Some examples of longer term hibernators are raccoons and skunks, chipmunks and woodchucks. A woodchuck stores food for the winter, but spends much of its time in hibernation. Every few weeks it will wake for a midnight snack, but as it goes to sleep, its heart rate drops from a normal 80 beats a minute to as low as five beats a minute. Its body temperature follows the same pattern, decreasing from a normal 98 degrees Fahrenheit down to 38 degrees. Perhaps the best known hibernator is the bear, but not everyone agrees. Some argue that bears don’t hibernate. Others consider bears to be super-hibernators. It’s all a matter of the animal’s temperature variation, and how easily it can wake from its winter sleep. We’ll let you decide how to describe an animal that can nap in its den for as long as 100 days at a time. American black bears can doze for months at a body temperature of around 88 degrees, just twelve degrees below that of its active summer state. That’s very different from the smaller mammals like chipmunks and ground squirrels. These critters must wake periodically (after days or weeks) to raise their body temperature, have a snack, and then return to hibernation. Bears just sleep on. That is unless they are disturbed. The low-temperature hibernators take a long time to regain awareness of their surroundings, but according to long time researcher Lynn Rogers it’s almost impossible to approach a black bear in its den without them knowing they have company. Although the bear is an exception, the average hibernator’s temperature falls to about 43 degrees Fahrenheit, and its heart rate to between five and ten beats per minute. Respiration also falls dramatically. Some animals can stop breathing for an hour or more. 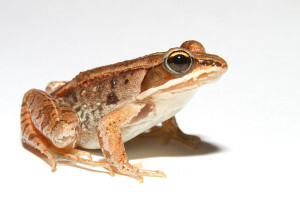 But the record for bodily extremes has to go to the wood frog. Cold blooded critters such as snakes, lizards, and frogs depend entirely on their environment to keep warm. Snakes, for example, will bask in the sun to absorb warmth, but during the winter they retreat to dens where the temperature remains above 32 degrees. If they stayed above ground they would freeze. And that’s exactly what the wood frog does. When the first winter ice appears, the wood frog responds by forcing water outward from the center of its body, so the internal organs are surrounded by water. Then the water freezes. Bodily functions stop. Breathing stops. The heart stops. There may be no heartbeat for days or weeks. As the frog freezes, its blood-sugar distributes itself through the circulatory system and acts as an anti-freeze. This keeps the water inside the frog’s cells in a liquid state, even when the temperature goes far below 32 degrees. But the frog itself becomes as hard as a rock – or an ice cube. The wood frog remains frozen until spring arrives. It then starts thawing from the inside out; a process that takes as much as a day. Since the winter was spent in what amounts to suspended animation, at least the frog doesn’t have to waste its time searching for food. Instead, it starts looking for a mate. From a single night to an entire season, hibernation allows animals to survive in what would otherwise be fatal surroundings. And when our spring travels take us back north, the wild creatures that spent the winter sleeping will be alive and healthy to welcome us.